Ed Steidl, Director, Offerings & Partnerships leads partnership activities for the 21st Century Jobs, Skills & Employability team at Microsoft. This work includes licensing, content and program co-creation and the establishment of public-private-partnerships (PPPs). Ed’s career spans across many different industries which include real estate and start-up technology companies. 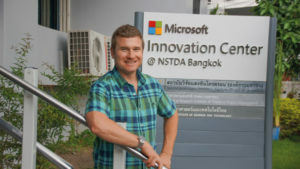 Ed has enjoyed a 9+ year career at Microsoft holding positions focused on business development, program management and scaled approaches to reskilling the global workforce. Ed Steidl is an innovation enthusiast who has a strong belief that people can be trained to be more creative. He created programs that help foster early stage entrepreneurship by helping develop an entrepreneurial mindset. With this experience Ed has a unique perspective on how innovation happens around the world in both developed and developing economies. Ed holds a BS in Molecular Biology from the University of Victoria and an MBA from ESADE in Barcelona, Spain. Ed is an active participant in high school education and current sits on the Board of Governors of Shawnigan Lake School in British Columbia, Canada and as a coach of the Washington State Loggers Highschool rugby representative team.